Done in the deep water with the aid of a noodle, this workout emphasizes core strengthening. This class is 30-minutes and may use a noodle or hand held weights. 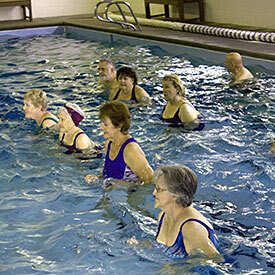 "I started doing water aerobics after back surgery in 1999. It's a great way to exercise with little stress on your joints. The instructors make it fun and everyone in the class is very friendly."